The Madrid Super Saver combines two best-selling tours at a discounted price – becoming a fantastic day out. 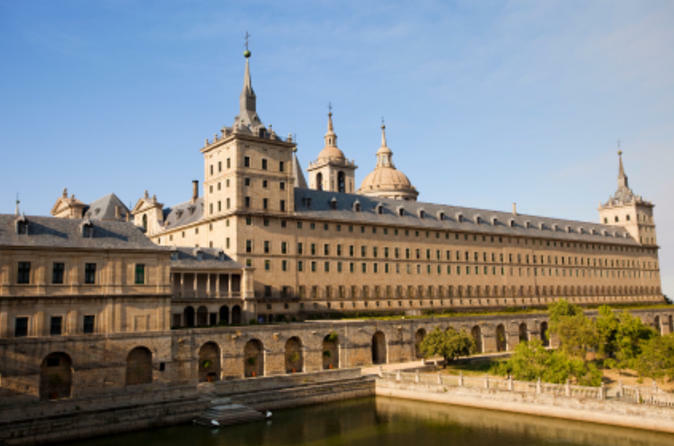 Experience the grandeur of El Escorial monastery, and visit the poignant Valley of the Fallen monument, erected in memory of the millions who died in the Spanish Civil War. Gain insights into Spain's intriguing history at these symbolic landmarks, reflecting the Spanish monarchy, church and 20th-century conflict. Then take a trip to Aranjuez, a beautiful World Heritage-listed royal city. You’ll be accompanied by a knowledgeable guide all day. The best part? By combining these two half-day tours, you’ll enjoy a 15% discount compared to purchasing the tours separately. The Royal Monastery of San Lorenzo El Real was built by King Philip II to house the remains of his parents, Charles I and Isabella of Portugal. The Renaissance complex combines a palace and monastery, and features a wonderful collection of art. On your visit, follow your guide on a tour of the complex, including the Pantheon of Kings and the basilica. Six miles (9.5 km) north of El Escorial lies the Valley of the Fallen, a vast basilica built into the side of a mountain and topped by a gigantic granite cross. The monument was built by Spanish dictator General Franco to remember the casualties of Spain's Civil War. Take a guided tour inside the basilica and admire the spectacular valley landscape surrounding the complex. Before you continue to Aranjuez, have free time to grab lunch (own expense) and relax before the second part of your day trip. Continue your trip to Aranjuez, a town of beautiful architecture and a regal atmosphere that lies 28 miles (46 km) south of Madrid. Your guide will lead you the Palacio Real (Royal Palace). The palace is a Spanish Royal Site – the spring residence of Spanish kings since the late 1800s. Admire the decorative styles and see the Throne Room of Elizabeth II, the Prince's Gardens, the Parterre and the Island.